On Target is the second book in the Gray Man Series. This book has many more thoughtful moments than the first book of the series but is still chock-full of action and a bit of suspense. Jay Snider returns as narrator and does a great job once again, I can’t imagine anyone else being the voice of Court Gentry. I don’t have a lot more to say about On Target, it is a very good spy/assassin story and it left me wanting more, much more. Court Gentry, aka the Gray Man, is back – and once again on the run from old friends and foes. Four years ago, Gentry was betrayed by his handlers in the CIA. Now, an old comrade, Russian arms merchant Sidorenko, returns to force him on a mission against his will: kill Sudan’s President Abboud, the supposed trigger for the Darfur genocide. But the CIA has its own plans for Abboud. With his ruthless employers on one side, his blackmailing former friends on the other, and a doomed mission ahead, Gentry would kill just to get out of this one alive. 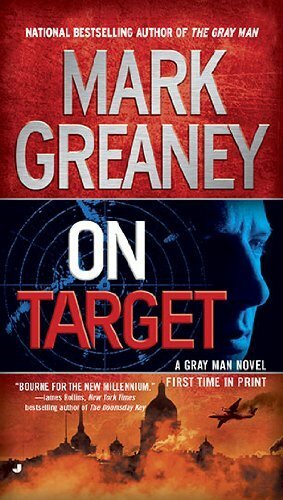 Every bit as thrilling, informed, and addictive as The Gray Man, and once again skillfully narrated by Jay Snyder, On Target is sure to hit the mark for thriller fans. ©2010 Mark Strode Greaney (P)2010 Audible, Inc. I rate this book an 8 out of 10 and recommend it to any fans of Spy and Action novels. The Gray Man novels begin with Court Gentry on the outs with the CIA and working as a killer for hire with a conscious. If that sounds familiar and derivative it is because it is. But the Gray Man is his own character with is own emotions and beliefs. 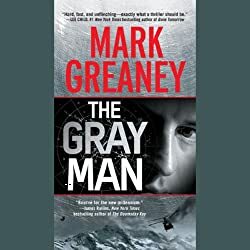 This is Mark Greaney’s first novel and it is a winner, full of action, intrigue, and twists Gray man does not disappoint. Jay Snyder’s narration is wonderful; he brings both Gentry and the other characters to life. I very quickly cannot imagine any other voice as being Court Gentry. This book is not about thinking, it is not literature, it is fast-paced action that doesn’t require much work on the reader’s imagination, but it was just what I was looking for. There are now 4 books in the Gray Man series and I can’t wait to listen to them all. I bought this audiobook on Audible and listened to it with the Audible app on my iPhone. Get ready for white-knuckled listening. Greaney’s debut novel – and future feature film – introduces the enigmatic and elusive Court Gentry, a former CIA operative and a legendary hired gun. With a terrifying ability to vaporize targets and a strict moral code, he stalks the gray margins of the world, moving silently from job to job, accomplishing the impossible, then fading away. When his government and former employers turn on him, there is no safehouse to run to, no way to lie low. In a constant state of escape and pursuit, Gentry tears through the Middle East and Europe in a riveting life-or-death race against time. ©2009 Mark Greaney (P)2010 Audible, Inc. I rate this book an 8 out of 10 and recommend it to fans of fast-paced spy and assassin action. 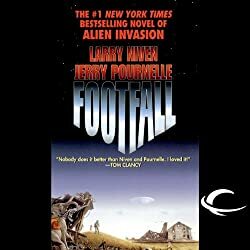 Written and set in the 1980’s, Footfall is a science fiction novel about the Earth being attacked by aliens from Space. Larry Niven and Jerry Pournelle do an amazing job of story telling, character development, and language. A big part of the story is the language used by the aliens; which is something I generally do not like in science fiction books. A bit of foreign language or difficult slang is ok for flavor, but a lot of it just makes a story very hard to read and follow. If I had bought this book as a paperback and tried to read it, there is a good chance I would not have made it all the way through, but as an audiobook it was fantastic. MacLeod Andrews does an amazing job narrating the story and bringing both the earthlings and aliens to life. He gives them all unique voices and really brings their emotions to life. I enjoyed this book immensely and look forward to listening to more Niven/Pournelle books. I bought this book from Audible and listened to it using the Audible app on my iPhone. They first appear as a series of dots on astronomical plates, heading from Saturn directly toward Earth. Since the ringed planet carries no life, scientists deduce the mysterious ship to be a visitor from another star. The world’s frantic efforts to signal the aliens go unanswered. The first contact is hostile: the invaders blast a Soviet space station, seize the survivors, and then destroy every dam and installation on Earth with a hail of asteriods. Now the conquerors are descending on the American heartland, demanding servile surrender – or death for all humans. ©1986 Larry Niven and Jerry Pournelle (P)2010 Audible, Inc. I rate this book a 9 out of 10 and recommend it to any science fiction fan. For a 39-year-old story this one holds up pretty well and it is fun to see the origin of many of the themes in more modern science fiction stories. I really enjoyed the idea that every time they get in a ship and head off to war they return hundreds of years later; it is an intriguing idea. So after one battle they return to find earth a very different place and the most experience veterans in the war even though they do not feel like it. I think any fan of science fiction should take the time to read the classics of the genres and understand more about the origins of the themes and plot elements that we take for granted today. And the Forever War is one of those classics that every fan should take the time to read. George Wilson’s voice has such a classic storyteller timbre to it; he really brought the story to life for me. 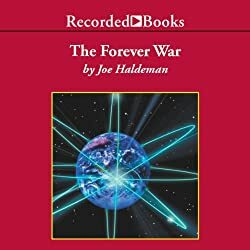 I bought The Forever War audiobook from Audible and listened to it using the Audible app on my iPhone. When it was first published over 20 years ago, Joe Haldeman’s novel won the Hugo and Nebula awards and was chosen Best Novel in several countries. Today, it is hailed a classic of science fiction that foreshadowed many of the futuristic themes of the 1990s: bionics, sensory manipulation, and time distortion. William Mandella is a soldier in Earth’s elite brigade. As the war against the Taurans sends him from galaxy to galaxy, he learns to use protective body shells and sophisticated weapons. He adapts to the cultures and terrains of distant outposts. But with each month in space, years are passing on Earth. Where will he call home when (and if) the Forever War ends? Narrator George Wilson’s performance conveys all the imaginative technology and human drama of The Forever War. Set against a backdrop of vivid battle scenes, this absorbing work asks provocative questions about the very nature of war. I rate this book a 9 out of 10 and recommend it to anyone looking for great classic science fiction.